When you’re the only girl in the house, hysterics really don’t work like they should. The evening started out innocently enough. I was home late from work, but my husband and the boys brought home some take-out for dinner from Pie In The Sky–our favorite. We’d all had a long day of work and school and were glad to be home. We sat at the kitchen counter eating and talking, catching up on our days, and all was well, until I headed for the last banana-chocolate-chip-muffin sitting on the kitchen counter. I grabbed a serrated knife and attempted to cut into the nearly rock-hard muffin, while looking away and talking to my husband, when the knife slid off and sliced my finger instead. Trust me. You do NOT want to see the atrocious wound that is under this Band-Aid. It is too gruesome of a laceration for anyone to have to look at. Immediately I could feel the injury was serious and deep. I grabbed a kitchen towel and applied pressure to the maimed finger as I doubled over in pain and then began pacing. “Oh, oh….I sliced my finger, I sliced my finger!!!!”. Thinking this would alert my husband into action, I turned to him just as he took another huge bite out of his sandwich, looking at me from the corner of his eye. Does the man have any other mode other than ‘Calm’????? “Um! Can you get a Band-Aid please!!!! !” I squealed, as I paced and moaned and tried not to faint. 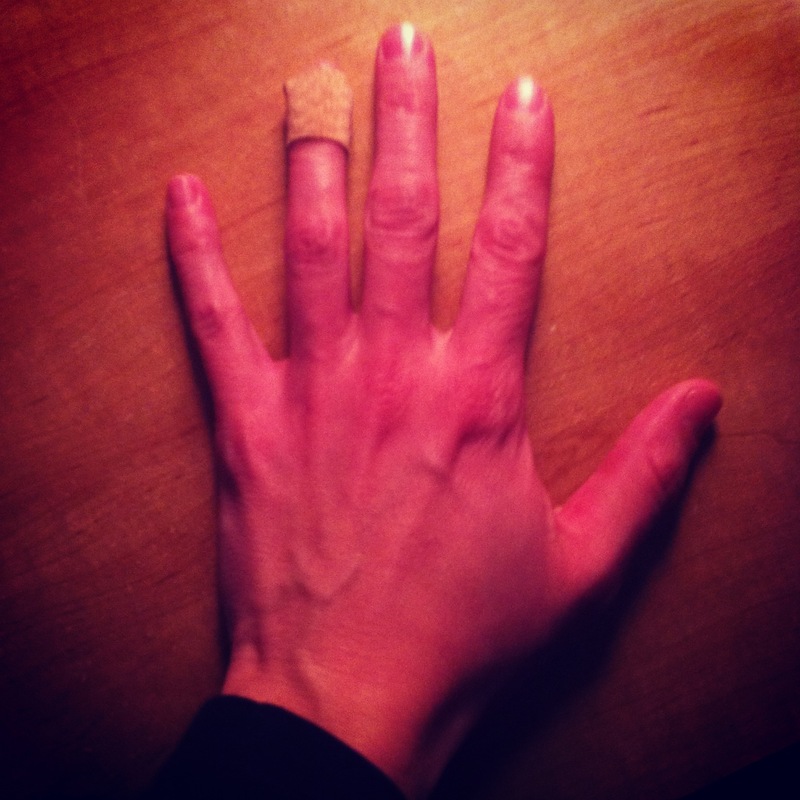 He slowly walks toward the cabinet and grabs the normal-sized box of normal-sized Band-Aids. “Uh…..We’re Going To Need Bigger Band-Aids!!! !” I demand, looking toward the cabinet to see if there are any tourniquets, slings, gauze, etc. The pain was searing. White-hot heat moved up my finger to my wrist and arm. It was unbearable. At this point, all color has drained from my face and my knees are feeling weak. My heart is racing and the room is beginning to spin. In my cloudy mind, I think that this must be because the trauma to my hand is so great and my body is trying desperately to stay alive. “Let me see it!” he demands. “No! I’m not taking this towel off!! Blood will squirt and gush everywhere!”. I catch a glimpse of my eldest son still eating his pizza slice and staring at me with a mixture of awe and confusion. My youngest has not taken his eyes off his cartoon. Does no one realize the gravity of the situation??? I wonder. “Let me see it” he says again, “we need to see how deep it is”. So, I take the towel off and immediately it begins to bleed, so I put the towel back on. “Okay, take it off again”. So I do, it bleeds, and then I put it back on. “Okay, take it off again”……..how many @*%$ing times is he going to make me do this!?!?!? I think to myself. As he slowly rips open the Band-Aid, I feel my knees becoming weaker and weaker as I slowly sink to the floor. I’ll be safer down here in case I faint I tell myself. I don’t want any head trauma on top of an amputated limb. Still holding my finger up to him, he gets ready to apply the Band-Aid: “Okay, you’ve got to be quick! !” I tell him in frantic tones…..”You’ve got to do it fast or else blood will just gush everywhere!!!”. He ignores my pleas, and with great calm and precision, applies the Band Aid to my gaping wound and is able to stop the bleeding. Then, in a gruff and barking voice, he tells me, ” You’re going to be just fine. The finger is a long way from the heart. Now get up”. Did he seriously just quote from his all-time favorite hockey movie at a time like this??? By this time, I’ve not only turned completely yellow in the face, but I’ve become extremely hot and sweaty. Now, with the bleeding stopped and my finger safely bandaged, I sprawl on the kitchen tile, start to unbutton my sweater and take off my hat. I’m so hot. I’m so hot. I’m breathing heavy. I’m feeling faint. I place my cheek on the cool tiles and it feels wonderful. My heart is racing, but I’m so thankful the bleeding has stopped and the cool tile feels so soothing on my sweating face. I made it. I made it. It is amazing how much trauma the body can handle. After a few minutes, I muster up the energy to walk myself to the couch to rest comfortably and to put my feet up above my heart. And then, suddenly, I become freezing cold. I have to cover up with a blanket so as not to go into some kind of shock. I can’t help but think that the wound is just so serious that my poor body is just trying to process what is happening. I lay there, closing my eyes, willing myself to stay conscious. My eldest gives me kisses on the cheek and hugs and stares at my finger as though it were some kind of specimen. My youngest has not taken his eyes off the t.v. After a while, I notice my breathing has slowed, my body temperature has gone back to normal and I am no longer seeing spots. So, I decide that a small bowl of Cinnamon Toast Crunch Cereal is what I need to feel completely better, since the muffin is now out of the question. After about twenty minutes, I feel well enough to head upstairs and get into my pajamas. It’s been a long and scary night and I’m ready for bed. I’m so grateful for my husband’s calm demeanor and gentle bedside manner through this entire ordeal. I’m not sure where I’d be without him. “Is this gonna end up on your blog?”. I love this! I’m the only girl in a house with three boys and two male dogs. If it doesn’t have wheels it doesn’t get my kids’ attention. Sometimes I wish for someone to squeel with and talk about clothes, but then I remember being a teenager and I feel better about my team of boys. Hahaha! He knows you too well. Cinnamon Toast Crunch can cure any ill. I’m glad you are okay. How winter-time driving both enhances my marriage and raises my blood-pressure. If you ever find me asleep but groggily chanting ‘roll-up pants, roll-up pants, roll-up pants’, PLEASE wake me up!! !